Regular Sound On Sound readers will already be familiar with Mike Senior's contributions to the ever‑popular Mix Rescue series, as well as his occasional (and usually lengthy!) features on comparative recording techniques. His background and experience make him ideally placed to write this book — he studied Music at Cambridge and gained an MSc in Music IT at City University. He has also worked as an assistant engineer at several London studios, before becoming the in‑house engineer at Great Linford Manor Studios, working with artists such as The Charlatans, Reef, Therapy, Nigel Kennedy, and Wet Wet Wet. However, when the charm of long, antisocial hours in dark studios finally wore off, Mike joined the SOS team as Reviews Editor, where he was instrumental in establishing the popular Studio SOS and Mix Rescue columns. Always seeking new challenges, though, he eventually left the magazine to set up his own training and consultancy business, while also freelancing as an engineer and SOS author. 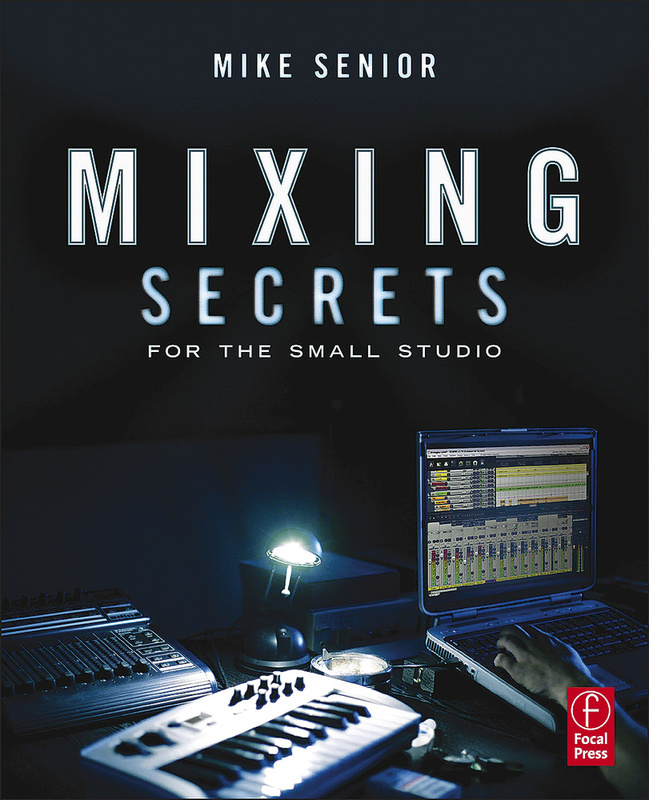 Mixing Secrets For The Small Studio is Mike's first published book. The title is something of a misnomer because the advice and guidance contained are relevant to everyone involved in music engineering and production, at all levels and regardless of the size of the studio or its facilities. Novices and grandmasters alike will find plenty of interest here. The emphasis is very much on mastering the correct approaches and techniques, rather than how to use any specific equipment or software, and everything is described in such as way as to make it easily transferable across any DAW platform or even to a traditional console‑based mix environment. The reader is expected to have a basic level of underpinning knowledge about the fundamentals of sound, audio equipment, signal levels, production workflows and so on, although there are excellent additional resources on the dedicated web site (see below) to help if some of these aspects are unfamiliar. The book is structured in a progressive fashion, following a logical mixing workflow, and developing and building on ideas and techniques throughout. The book is very readable, in Mike's familiar, approachable and often humorous style, and with plenty of illustrations, all of which maintain the interest from cover to cover. The text also expands on Mike's own wealth of experience and knowledge with numerous relevant quotes and opinions from over 100 of the world's best-known engineers and producers. The 340‑page book contains 20 chapters grouped into four main sections covering hearing and listening, mix preparation, balancing, and sweetening. Usefully, every chapter concludes with a 'Cut to the Chase' section summarising the key techniques and 'secrets', along with an 'Assignment' section detailing practical exercises to hone new‑found skills. Appropriate audio material can be downloaded from a dedicated section of Mike's own company web site (www.cambridge‑mt.com/MixingSecrets.htm), with numerous illustrative audio files, links to recommended software and other resources, and — most impressively — a wide variety of high‑quality bespoke multitrack material to enable readers to practice and develop their mixing skills and processing techniques. Part 1 of Mixing Secrets begins with a detailed discussion across four chapters on how to choose and use nearfield monitoring, including understanding and working around the limitations of budget equipment, optimising the listening environment, and 'self calibration' using commercial music reference material. Essential pre‑mix groundwork is covered in three chapters through Part 2, dealing with timing, tuning and arrangement issues. The main meat of the book is contained in Part 3, where eight chapters cover the nitty‑gritty of compression, equalisation, side‑chains and the fundamental art of balancing. The emphasis throughout is always on applying these powerful tools to address specific identified mix issues, and using them skilfully. However, Mike also enjoys describing some particularly elaborate and advanced applications, often using complicated side‑chain processing — but always to achieve a worthy end goal! The final section comprises five chapters dealing with mix sweetening techniques, including the application of reverbs and delays, stereo processing and other effects, bus compression, and the use of mix automation. The book concludes with a couple of appendices detailing his quote references and providing a thorough discography.